SwimFreshs advanced Oxy Silver Puriﬁers (OSP) provides exceptional sanitation for new and existing pools. SwimFreshs advanced Oxy Silver Purifiers (OSP) provides outstanding sanitation for new and existing pools. With two models available (OPS100 and OSP50), SwimFresh OSP Systems include Ozone generation and the ingenious Silver Cellerator, which is designed to inject your pool or spa water with healing bursts of Ozone, Copper and Silver Ions. This unique combination of Ozone and Silver are automatically produced to kill bacteria and copper is automatically generated to prevent algae. The results are sanitised crystal blue clear water that feels unbelievably smooth, silky and pure. 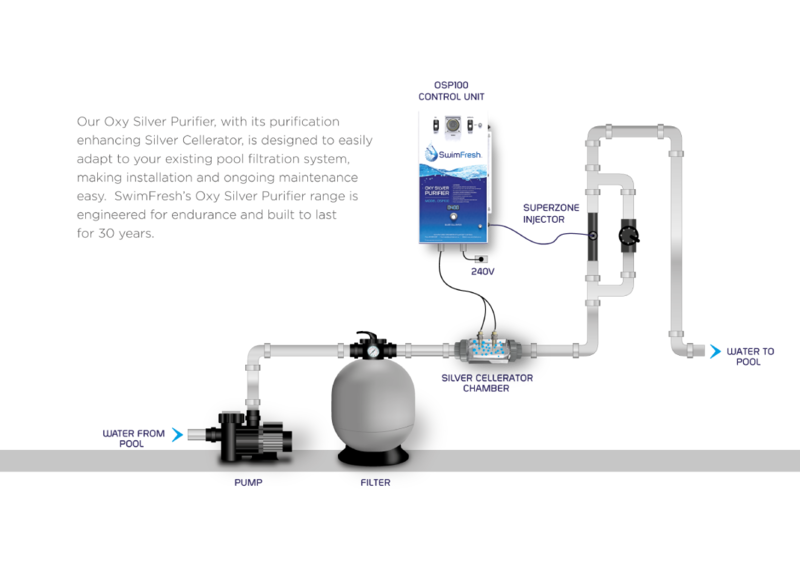 SwimFresh OSP range sets the Silver standard for Ozone water purification. Our Ozone generator is built to the highest standard, using powder-coated, marine-grade aluminium. And all connections are hard anodised, with stainless steel fittings, to ensure the health of your pool for years to come. It also Includes a quality German timer with aviation grade switches and a digital display. The world renown Kynar Mazzei injector with a quality non-lube jandy valve built into grey pipe manifold will never deteriorate. The SwimFresh Cellerator Ioniser housing is a blow moulded UV stabilised Acrylic block with super duplex stainless steel connections. An outstanding high-quality commercial system that will last at least 35 years. Our range ensures that you are more invigorated, more refreshed and more alive than ever before, day after day. Whether you are an existing pool owner who wants to enjoy the benefits of ozone water or you're planning a new pool build, SwimFresh's water purification systems can be tailored to suit your needs.